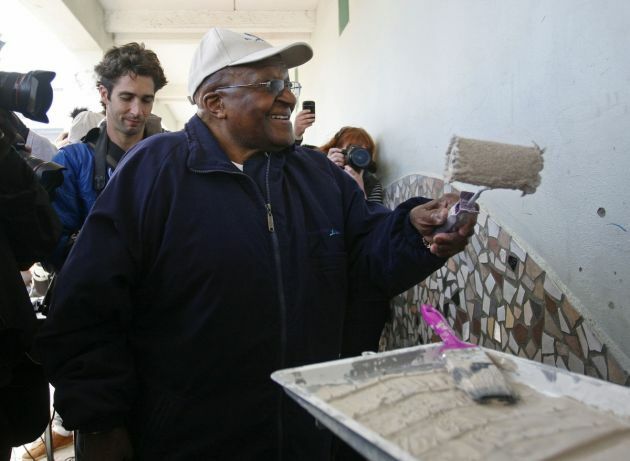 (Photo: REUTERS / Mark Wessels)Archbishop Emeritus Desmond Tutu does his 67 minutes of community service for International Mandela Day 2013 as he paints a wall at Marconi Beam Primary School in Marconi Beam, Cape Town, July 18, 2013. The ailing Mandela turns 95 today. Archbishop Emeritus Desmond Tutu has visited his fellow Nobel Peace Prize laureate former president Nelson Mandela in the hospital. Tutu visited Mandela on Friday, the day after the anti-apartheid icon celebrated his 95th birthday on July 18. "We have a special gift in a man who can unite not only South Africa but the world, even from his sick bed," said Tutu after leaving the Pretoria hospital Friday where Mandela is being treated. South African President Jacob Zuma thanked people in his country and around the world for their support and display of love for the country's former president on Nelson Mandela International Day. "Madiba's condition in hospital continues to improve steadily and we are very encouraged by this development," said Zuma at a press conference with Europen leaders. European Commission President José Manuel Durão Barroso, said in a speech at the University of Cape Town that the odds were stacked against Mandela pulling off a peaceful transition after his release from jail in 1990. "It is true that the general environment had never been so propitious to the demise of apartheid. "The Soviet Union was collapsing: Nelson Mandela was freed three months after the fall of the Berlin Wall. Adopted almost universally, sanctions against the regime were biting." Barroso noted, "South Africa was blessed by Nelson Mandela's vision and by his courage to live up to it. His mind was clear and being the man he is he found he had to share his wisdom and his hopes with his brothers and sisters whatever the cost." Mandela is revered globally and in his own country for being a key leader in in the struggle against white minority rule and then for preaching reconciliation after being imprisoned for 27 years. He was South Africa's first black president from 1994 to 1999 and stepped down from power after five years as president. The former archbishop of Cape Town, who was himself a prominent anti-apartheid icon, said South Africa needed to give thanks to God for the gift of an incredible man like Mandela. "He inspired us to become a great country and the world to become compassionate," said the speaking on the international Nelson Mandela Day. Tutu said Madiba, the clan name by which is often used to refer to Mandela, was spending his 41st day in the hospital due to a recurring lung infection. He was asleep but Tutu managed to touch him and hold his hand. Tutu praised Mandela's and the three spouses he has had. "I am humbled by the relationship and give thanks to a wonderful Graca in giving him joy in later years. I also salute Winnie for being extraordinary during hard times. I salute her and she knows," said Tutu. Former Indian prime minister and leader of the Congress party country said in India on Friday, "Today when the world is confronted with a crisis of leadership with moral force, you stand out as a symbol of indomitable spirit. "We pray and wish that the world continues to benefit from your wisdom and reassuring presence," said the Italian-born Indian leader.